I’m delighted to welcome you to Working Forward after the hugely successful launch on 14 September at the Houses of Parliament. We are excited that news of the initiative is travelling fast and, since the event, over 60 employers have joined the coalition of high-profile employers and leading industry bodies, representing over 300,000 employees across the UK. The event was attended by a number of our Founding Members, including BT Group, Mitie, Royal Mail, John Lewis and Barclays, official supporters such as Acas and the IoD, and parliamentarians such as Caroline Dinenage, Nicky Morgan and Maria Miller. We are extremely grateful to everyone who showed their support and of course to Hannah Bardell and Angela Crawley for co-hosting. It was a great opportunity to hear from inspirational speakers on the importance of treating women fairly in the workplace and of harnessing the huge amount of female talent to make businesses more productive. It was also a great chance to speak to a number of like-minded people about their experiences and discuss what works. This initiative is all about dialogue, enabling organisations to share best practice. 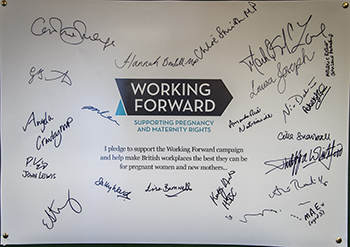 We also asked all of our Founding Members at the launch to sign a real pledge to support the campaign and help make British workplaces the best they can be for pregnant women and new mothers. This is just the beginning – we hope that soon one sheet of paper will not be enough! Working Forward has been warmly welcomed in the media, with coverage in The Telegraph, People Management, Sky News and ITV News, plus a discussion of its aims on BBC Breakfast. The stories have focused on both the extent of discrimination against pregnant women and new mothers, and the startling fact that if women’s participation in the labour market increased to roughly the same as men’s, it would add 10 per cent to the size of the economy by 2030. As you are aware, Working Forward aims to bring about a significant change to end pregnancy and maternity discrimination and demonstrate what organisations can do to develop and retain women in the workplace. As research from McKinsey shows, diverse companies are 15 per cent more likely to have financial returns above the industry median, so what is good for women is good for business. The initiative focuses on four key themes: leadership from the top down; ensuring confident employees; training and supporting line managers; and flexible working practices. As members, you can expect to receive exclusive content, such as video case studies, blogs and online training, to support you on these themes, including this quarterly e-newsletter. All of this will help you develop forward-thinking policies, programmes and initiatives, and ultimately bring about positive long-term cultural change for your business. Together we will raise the bar, showing strong leadership and inspiring business of all sizes and from all sectors to join us and ensure that female talent is nurtured and valued. If you have any feedback or questions, please do get in touch with myself or the team at pregnancy@equalityhumanrights.com.